Welcome to Luxe Eleven! Look for number eleven. Enter into your downtown getaway. The living room is the perfect amount of space. Unwind with a glass of wine after a long day of exploring. Watch your favorite shows on the flat screen TV. The full bath is just off this room. Simple and elegant. The fireplace (now decorative) anchors the room. View of the attached bath. The kitchen is towards the back of the apartment. A nice size kitchen with all the essentials. Stainless steel appliances and solid wood counter tops make cooking easy. Prepare a quick bite for breakfast. The breakfast nook is near the fridge. Sip your morning coffee and plan the day. A full size pantry is great for meal prep. The bedroom is off the living room. Find a closet behind that full-length mirror. Crawl into this luxurious Queen size bed. Just enough space for two. The fireplace (now decorative) is original to the home. View from the full bath. The full bath. The full bath has a tub/shower combo. Marble tiled shower. Soap and towels are provided! The entrance to your suite. 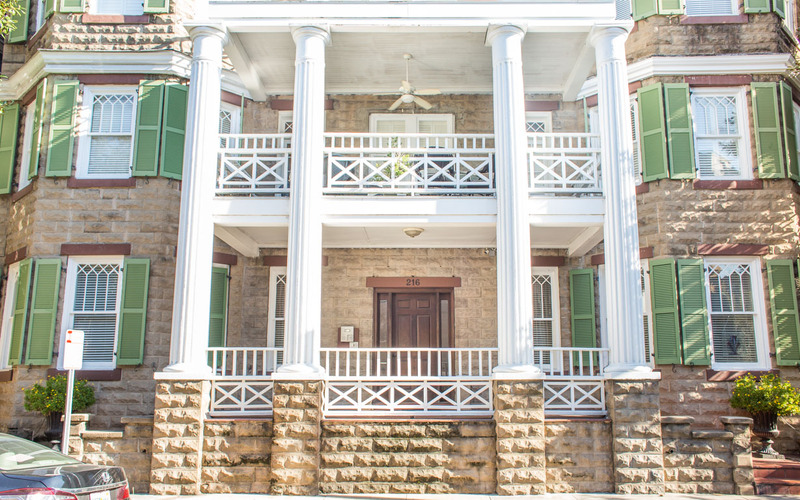 View of the front entry. Luxe Eleven is located on the third floor of this brownstone. Stay right in the heart of downtown. Luxe Eleven overlooks a beautifulsquare. Set off on foot to explore historic downtown. Savannah is a super bike-friendly city! Nearby fountain in the square. Everything is within short walking distance! Stay in the heart of the National Landmark Historic District and never use your car to see Savannah. 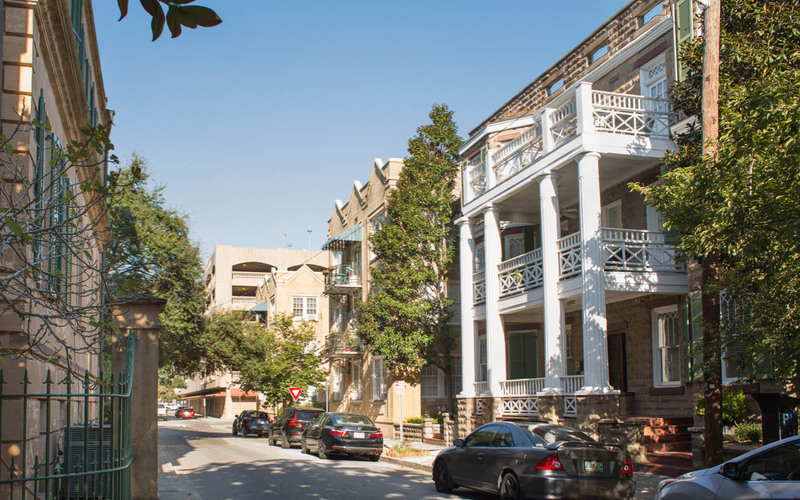 This is a third-floor, one-bedroom apartment located in a charming brownstone overlooking Oglethorpe Square. Walk up to your luxe apartment and look for the number eleven. A double keyless entry from the street keeps this apartment safe and secure. Two Lucky guests will have every essential they'd need to have a clean and comfortable stay in the heart of it all. Enter into living space, boasting tall ceilings and plenty of natural daylight. A flat screen TV is opposite the sofa for late-night shows or early morning news. Take your time each morning and brew a pot of coffee in the spacious full size kitchen. Enjoy cooking while traveling? Stainless steel appliances and butcher block counter tops make cooking and clean up a breeze. The master bedroom is just off the living space, with Queen size bed and a full size closet. A full bath with marble tile and a standalone vanity can be found attached to the living area. 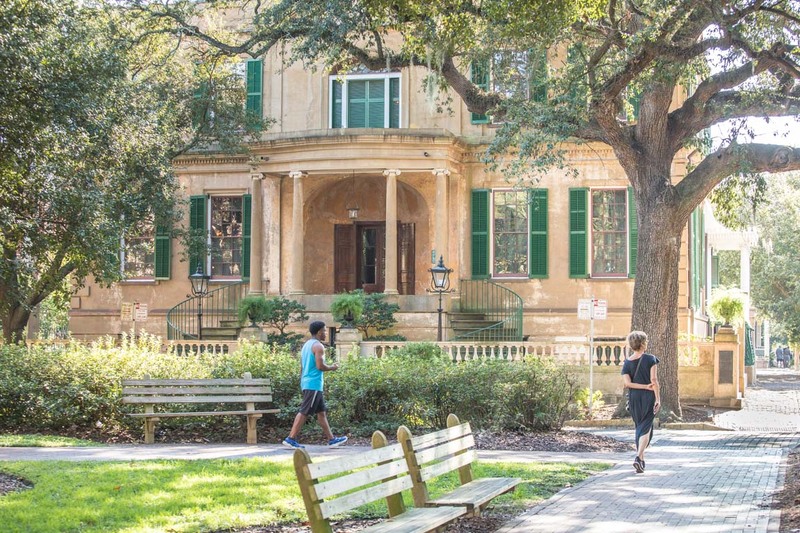 Situated directly across from Oglethorpe Square, guests are just a few steps away from Savannah attractions such as Owens-Thomas House, Telfair Museum, and the string of local shops and cafes along Broughton Street, Savannah's "Main Street". Walk through the squares with an ice cold beverage from one of the several bars found in City Market, heading towards River Street to see the massive cargo ships sail by at sunset. Local dining options abound with some of Savannah's most popular picks, like Flying Monk Noodle Bar, The Olde Pink House, The Collins Quarter, and Husk Savannah. Parking is on-street and metered, which is enforced by the City of Savannah Monday to Saturday, from 8am to 8pm. Guests are encouraged to either purchase a prepaid parking pass at the Savannah Visitor Center, or find a nearby parking garage to store their vehicle in for the remainder of their stay. Unless planning a day trip to Tybee Island (Savannah's Beach) or Wormsloe Plantation, everything can be accessed on foot. Stayed at Luxe Eleven for two nights and had a great time! The unit is clean and bright with everything one or two people could want. Well equipped kitchen with coffee maker and coffee (a considerate touch! ), comfortable Queen size bed and plenty of towels. Well located for Broughton Street but because it's one street back without the noise element. Easy walk to Broughton and River Streets, Zumzi's cafe is a few yards away (highly recommended, but expect to stand in line) and a heap of cafes/restaurants just around the corner along with a number of SCAD buildings. Would recommend this accommodation to anyone. Be aware that it's a third floor walk-up which may not suit everyone. Great location in Savannah. This apartment has much going for it. Most comfortable bed, space needed for 1-2 people, attend a bonus outdoor space at the end of the hall. Great light streams through windows a.m.d the couch is also comfy for releasing after a long walk around historic Savannah. It was also immaculate. Initially, there was a miss with towels missing and bedding not made.Patrice was kind and fixed the situation same night. What's missing? A table or floor lamp in the living room,a dresser in the bedroom, a side table of some nature in the bathroom, & additional bathroom towel bars or hooks. The shower needs some TLC. had a great time. location was good. my only complaint was there wasn't any place to put your clothes or toiletries. The location was PERFECT for out time in Savannah as it was close to the River and other attractions., The unit was clean, attractive and comfortable for the most part. While the professionals we contacted responded quickly, we did spend a very hot first night in the apartment as we could not get it cooled down. In part I'm sure this was due to unseasonably warm December weather in Savannah while we were there. Additionally, while the water in the kitchen sink and bathroom sink was hot, the water in our shower never did reach a point past luke warm. Two gentlemen came to check on it and reported that it was hot. I didn't check on it at the time, but the next morning we could tell no change it the water temperature. Loved getting to stay somewhere clean and sleek right in the heart of the historic district. We parked our car on the street (with a paid Visitor parking pass) and walked everywhere for 3 days. Would recommend.